BROOKLYN — Community leaders involved in a contentious rezoning plan for two Brooklyn schools — a process that has highlighted a race and class divide — are blaming the city for failing to keep them informed. The Department of Education presented its final draft of a plan to redraw the zone lines for P.S. 8 in Brooklyn Heights and P.S. 307 in Vinegar Hill Wednesday night at a jam-packed District 13 Community Education Council meeting. The new zones would shrink P.S. 8’s current area — one of the largest in the city — while expanding P.S. 307’s zone, which is largely composed of minority students, many of whom live in the nearby Farragut Houses. But even though the DOE amended its initial Sept. 1 presentation with more evidence to bolster its push for rezoning and implement a task force, parents and community leaders said they still believe the city handled the rollout badly. The rezoning could affect children set to enter the two schools next year. "It’s clear that we have a big challenge," said CEC 13 president David Goldsmith. "And our challenge is exacerbated by the history of poor planning by the Department of Education [and] uneven development of our schools." State Sen. Daniel Squadron said Wednesday that the DOE had "failed" to collaborate with the school communities or consider the stress caused to administrators and parents. "If you feel like the DOE has pitted neighbors against neighbors, it’s because it has," Squadron said at the meeting, which was held at P.S. 307. Officials from the Office of District Planning had previously faced backlash from P.S. 307 parents, who accused the DOE of neglecting the needs of their school while focusing on P.S. 8. But in Wednesday’s presentation, a new slide outlining a "growth plan" for the Vinegar Hill school was added to the presentation. "I think that there’s a general fear that as a department, we’re going to come in rezone, and leave," said Tim Castanza, a city planning rep. who spoke at the meeting. 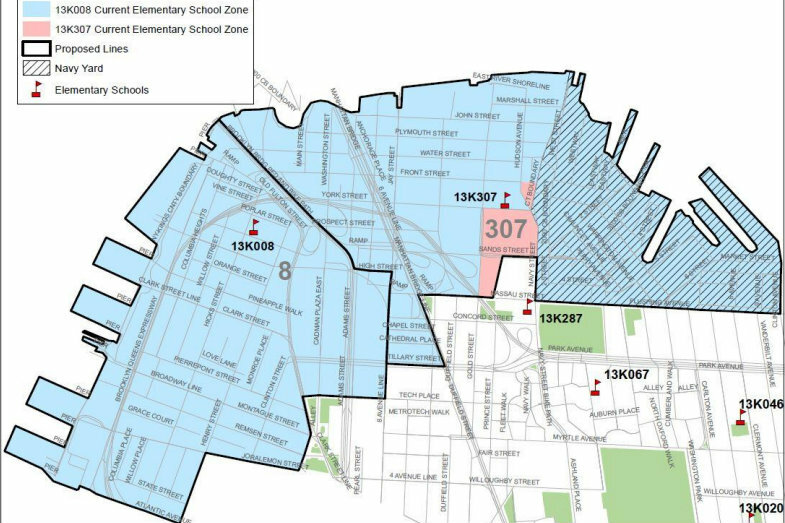 The rezoning would create an additional 360 elementary school seats in District 13. The higher enrollment would bring in more funding as well as new staff and teachers while supporting the existing programs at the school, such as its Mandarin classes, ASD Nest & Horizon, and pre-K, Castanza said. 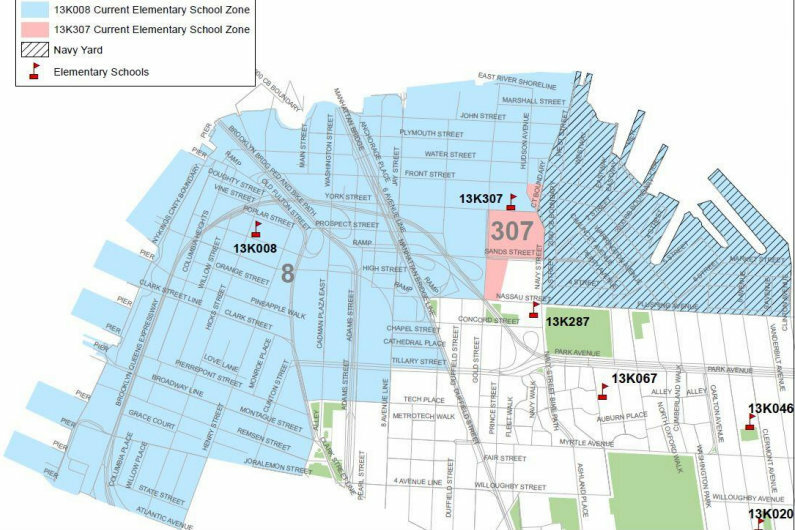 The DOE’s main reason for rezoning is the severe overcrowding at P.S. 8, which this year had a waitlist of 50 families and is currently at 143 percent of its building capacity. The proposed zones would more equally split neighborhoods between the two schools, moving DUMBO to P.S. 307’s zone and leaving Brooklyn Heights and Concord Village with P.S. 8. The plan would also involve moving M.S. 313, which currently shares a building with P.S. 307, into an upcoming Dock Street development to free-up space for new students at the elementary school. DUMBO dad Matt Cowley, who has two young children, said he agrees with the need for rezoning but felt the DOE had “sprung” the idea on him and his neighbors without giving them enough time to learn about P.S. 307 beyond the notion that it is a low-performing school. "All I know about [P.S.] 307 is, sadly, the numbers that are published," he said. But the plan has its share of advocates among P.S. 8 parents who do not want another year of overcrowding and the uncertainty of school waitlists. "We believe that having certainty now will help us build bridges as communities," said Ansley Samson, on behalf of the P.S. 8 PTA. Another fear that community leaders noted was that the DOE had not adequately addressed the racial divide that exists in the segregated communities. P.S. 307 is predominantly black and Latino while P.S. 8 enrolls mostly white students. The past month has seen an outpouring of feedback from parents and community members on the rezoning and a "great majority of concern… was about there being not enough time," CEC member Amy Shire said. If the CEC approves the plan in early November when it is expected to vote, the new zones will be in place for the 2016-17 school year. The 45-day clock for the CEC's vote will only begin once there is an official handover of the proposal. Several advocates for P.S. 307 insisted that more time was needed to plan and discuss the rezoning. "I suggest a period of no less than two years," said the Rev. Mark Taylor, a community leader whose speech drew a standing ovation from many black parents in the audience. "This is a bad plan." DUMBO dad Matt Tartaglia echoed those concerns on behalf of his neighborhood, saying he felt equally in the dark. His nearly 4-year-old child would be rezoned to P.S. 307 under the new plan. "Nobody from our community had any understanding of this 'til Sept. 1," he said. "Telling us our kids don’t even have an option [for P.S. 8] isn’t fair."